I shape, curate, and coordinate a primary element of Lutheran worship—music. I love the term "cantor," which has a long history in Judaism and Christianity. The cantor leads the people's song—the most important element of sacred music. I propose suitable hymns and songs to the pastors, choose psalm settings and liturgical music, and present appropriate instrumental, vocal, and choral music. I work to make sure the music for Sundays echoes the diversity of the church universal, while reflecting the character of our community and contributing to a unified experience. I lead from the organ and piano for half of Advent's services. I have been a volunteer church musician since age five, and a professional since age seventeen. It is a second job I seem compelled to squeeze into my busy life. Whenever I have taken time away from this work, I am always drawn back to it. Being a church musician allows me to serve others through music. It is a privilege to walk with people in song each Sunday, and to minister to them as they observe milestones such as baptism, marriage, and death. I came to Advent as a new member in 2010, just after I moved to Manhattan for doctoral study. After visiting several churches, Advent seemed the obvious choice, based on the warm welcome, fine preaching and music, and strong sense of community. At the time, I had been a church musician since 1997, and needed "at least a year off." Just over a year later, Pastor Brown called me and asked me to join the music staff. This community has nourished me in times of personal stress, and I am delighted to nourish others in such a warm and appreciative place. Singing or playing in worship, any hymn or song we sing in worship, how our pipe organ works, how to sing, and Advent's sound system. Also, music education, urban education, classical music, musical theater, jazz, comedy, American history, NYC history, rail travel, cooking, biking, swimming, hiking, and great books. When I'm not at Advent, you'll most likely find me . . . Being a college professor at the University of Bridgeport in Connecticut, where I direct the Music & Performing Arts program, or conducting the Mystic River Chorale (also in Connecticut). When not at work, you'll find me reading, writing, cooking, listening to podcasts, exercising, or spending time with loved ones and pets. Dr. Frank Martignetti has been a professional church musician since 1994, serving Lutheran, Catholic, Presbyterian, and UCC congregations. A choral conductor, music educator, organist, and vocalist, he has led workshops on liturgy and worship, choral techniques and repertoire, and global hymnody for a variety of audiences, including chapters of the American Guild of Organists, the Association of Lutheran Church Musicians, and Union Theological Seminary, Columbia University. 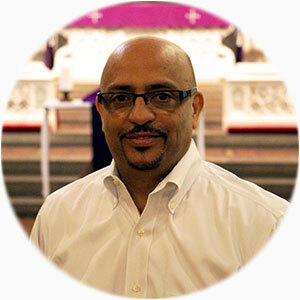 Frank currently serves as Dean of the Greater Bridgeport (CT) Chapter of the American Guild of Organists and Treasurer of the Connecticut chapter of the American Choral Directors Association. Noted for his ability to build and revitalize programs, Frank has served as Artistic Director of the Mystic River Chorale, Mystic, CT since 2008, and is an Assistant Professor and the Director of the Music & Performing Arts Program at the University of Bridgeport, CT, where he has taught since 2005. His choruses have performed at distinguished venues including Lincoln Center and Carnegie Hall, and notable performances conducted include the New England premiere of the concert version of Leonard Bernstein’s Mass. Martignetti holds degrees in history, conducting and music education from the University of Rochester, the University of Cincinnati College-Conservatory of Music, and the Eastman School of Music, and received his Ph.D. in Music Education at New York University.